Now that we have today’s high and low temperature in, we can confidently say the average temperature will be 67.4 degrees, which just barely edges out 1991 to make September 2011 the 2nd warmest on record here in Portland. Even more interesting was the average high of 79 degrees, which was warmer than July’s average! That shows (once again) how chilly the first half of summer was. That 79 is not in the top 5 though. We’ve had several other Septembers with the average high temperature around 80, but the lows were cooler. So the unusually warm nights really did it this time around. Over the past two weeks KPTV and PDX-TV have made a subtle change in the on-air broadcast, one that most of you probably didn’t even notice, but it will give us some more “room” on our weather graphics. Up until about 4 years ago, we (and the other stations in Portland) were broadcasting in what’s know as “4×3” size…the old square televisions. Then about in 2007 or 2008 we began broadcasting in “16×9” size, which is the size you see in the image above. This is separate than HD…not all stations are broadcasting news in HD in Portland, but all are in 16×9 aspect ratio. Seems pretty straightforward so far? Not quite. Many of you have still been watching on older square television sets, or, more important, the signal that was going out on many cable systems was just the “hacked out” 4×3 section of our signal. So if you look at the image above, imagine that most cable viewers could only see from one edge of the 7 Day forecast to the other edge. In fact that’s what we see on our cable feed here in the weather center. Obviously that leaves a lot of empty real estate, and means the 7 Day forecasts on all the stations are real narrow. Starting about two weeks ago, we began “letterboxing” the signal to the cable carries and satellite services. That means the entire wide newscast is sent out, and those with square televisions (not too many left) are seeing black bars at the top and bottom. That’s the same thing you see with FOX programming, American Idol, NFL Football etc… For everyone else watching on newer sets and digital cable feeds nothing has changed; you still see it all. Not a huge change, but noticeable. I made widen it a bit further depending on exactly where the “safe title” area is. Now you know what we do in television weather…obsess over the size of the graphics. On to the weather…nice easterly downslope wind this evening. You know it’s more of a downslope than Gorge wind when PDX is getting much strong east wind than Troutdale. Larch Mountain, Washington has been seeing strong gusts as well. 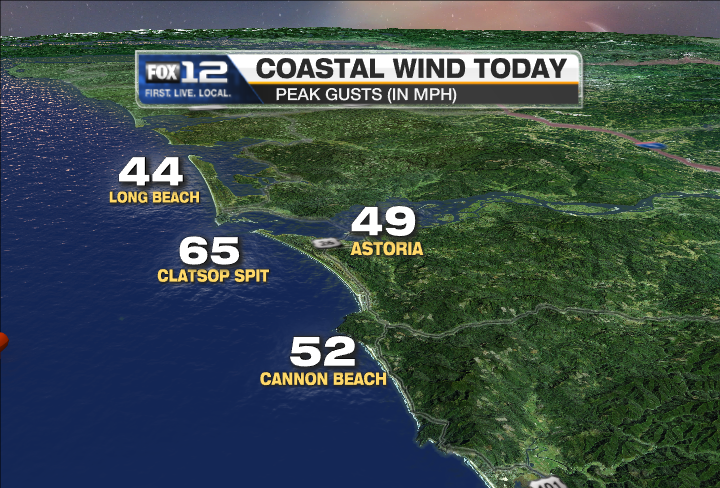 The wind dies down tomorrow quite a bit, but will probably increase in the Gorge significantly the next few hours first. Very little to talk about until we get to a real rainy/windy period that begins Sunday night and continues through most of next week. In fact the first week of October looks more like early November! Not temp-wise of course, but unusually wet and windy. I did some good old style number crunching this evening: The average temperature at PDX through today is 67.98 degrees. That is warmer than the warmest September on record (67.6 in 1994). So then I took our forecast for the next 3 days, out of the 7 Day forecast, and recalculated the average temperature for the month. If our forecast is correct, the average temperature should end up at 67.5 degrees. 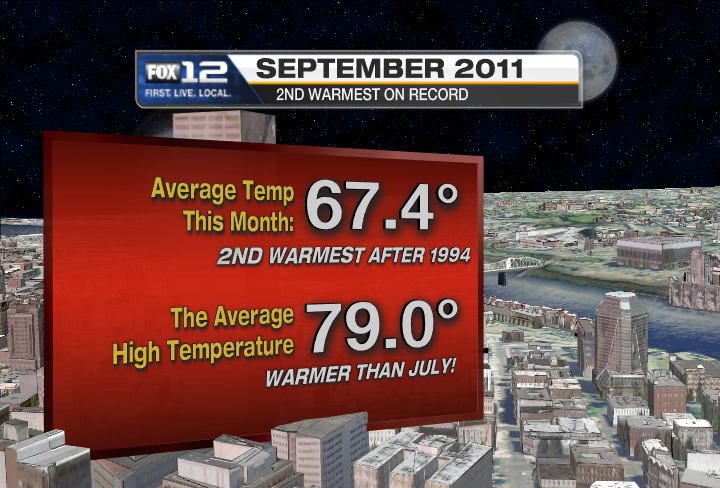 That would just barely edge out 1991 for the 2nd warmest September here in Portland. We’ll see how that works out, but it’ll be close. As for weather forecasting the next few days; two items of interest. One is the gusty east wind coming in tomorrow. High pressure develops east of the Cascades and the pressure gradient through the Gorge ramps up from about zero at daybreak to 6 millibars by 8pm according to the WRF-GFS. It shows 45 kt (50+ mph) wind up around 2,000′ exiting the Gorge. That should easily give gusts 40-50 mph at the west end of the Gorge and 25-30 mph across a good chunk of the metro area after sunset. I bet we get our first 60-70 mph gust at Vista House this season between 7-10pm tomorrow. 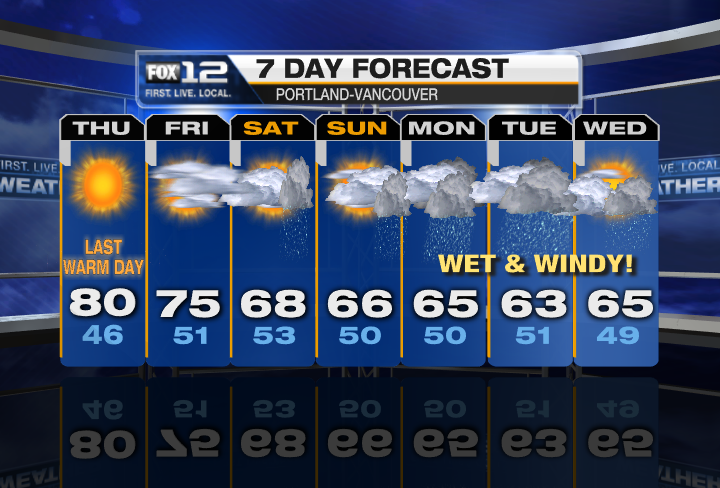 The wind dies off quickly Thursday afternoon, then it’s dullsville weatherwise through Sunday. The green line is the average 850mb temp the next 16 days. 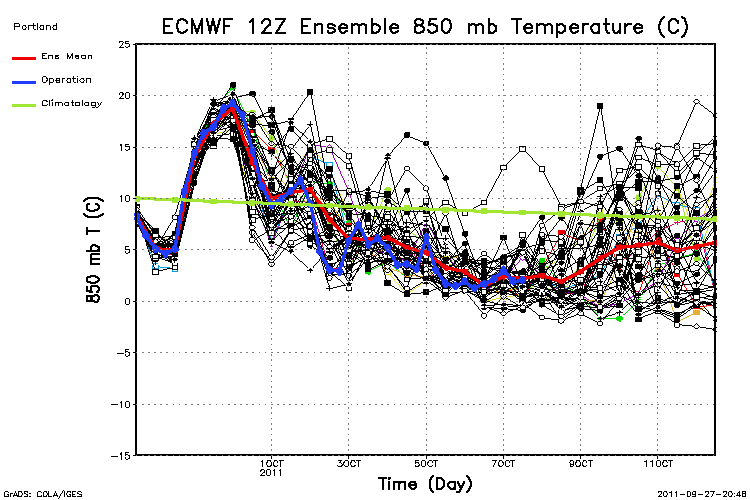 The thick blue line is the actual operational ECMWF run the next 10 days. The ensemble average is red. 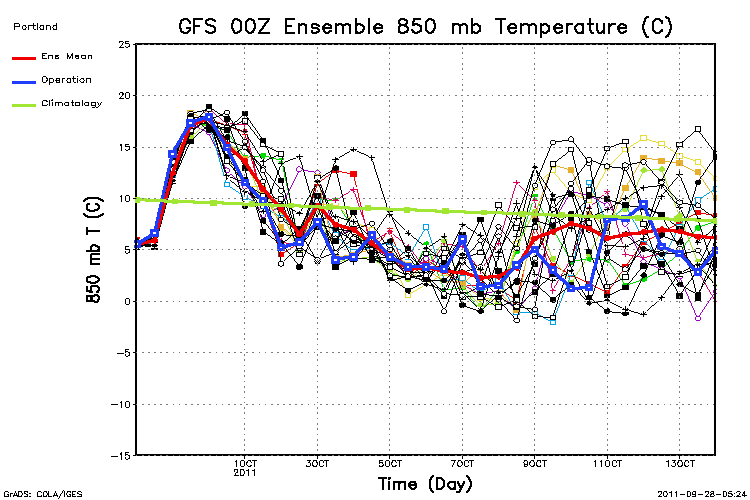 You can see that beginning Sunday the 2nd 850mb temps go below average not only on the operational run but almost all the ensemble members too. That continues through at least the 12 day mark. If you’re looking for warm and sunny early October weather I sure don’t see it here. Below average upper-level temps from later this weekend through at least the following 8 days or so. Feels Like Fall Now Doesn’t It? We had a nice early Fall storm today out along the coastline. Peak wind gusts in the populated areas were generally around 50 mph, but the usual exposed spots made it up into the 60-70 mph range. 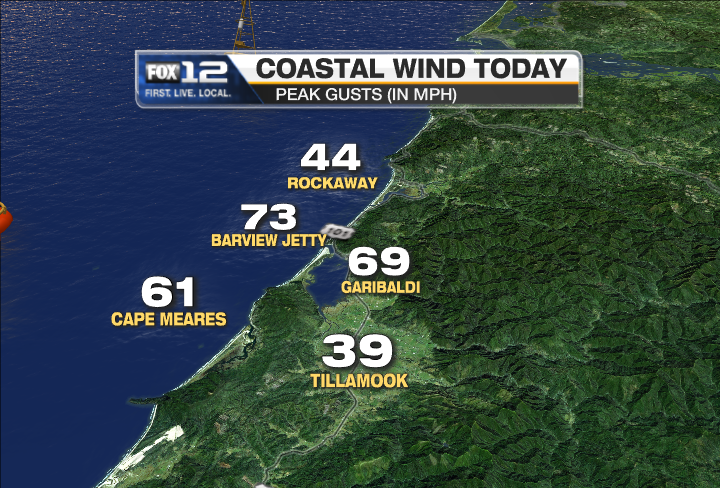 The highest I saw was at the Barview Jetty…73 mph. Here in the valleys most locations were in the 25-30 mph range. This was a “southeasterly” storm where the deep center of low pressure was a long ways off and the gradient wasn’t straight southerly up the valley. In that case our wind generally doesn’t get too wild in the valleys. 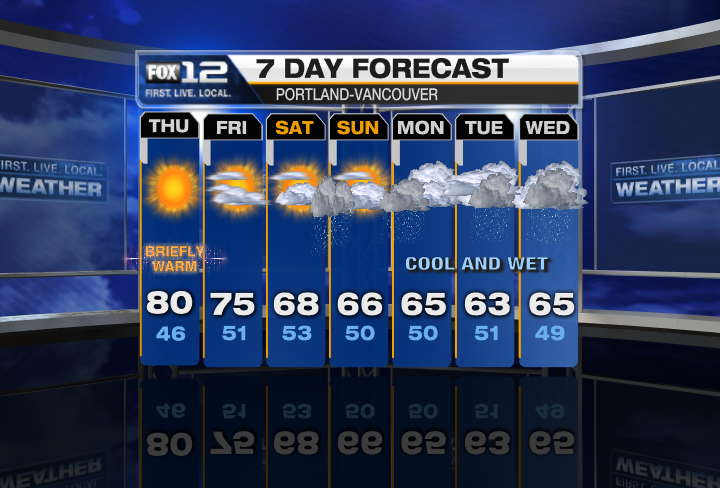 Pretty quiet weather the next few days. We get our first “Fall East Wind” Wednesday. By that I mean high pressure develops to the north and then quickly flops down east of the mountains. WRF-GFS shows 40kts. easterly wind at about 2,000′ over Portland later Wednesday and Wednesday night. The first day of wind (Wednesday) won’t be too warm, but a nice day. 850mb temps zoom up into the upper teens range by Thursday afternoon though! Our forecast of 78 might be too cool. The biggest story when I look ahead at the weather maps is that no one pattern or weather lasts for very long. It’s looking much more changeable. From trough to ridge to trough. Some model runs have a deep low close to the West Coast early next week. Others don’t; but something to watch. 1. A much better view of cold fronts coming in from the northwest. 2. We’ll be able to see exactly where low pressure centers are that move offshore near Tillamook, Astoria, or Ocean Shores…all the way up to Cape Flattery. And we’ll be able to see that clearly 100+ miles offshore. 3. 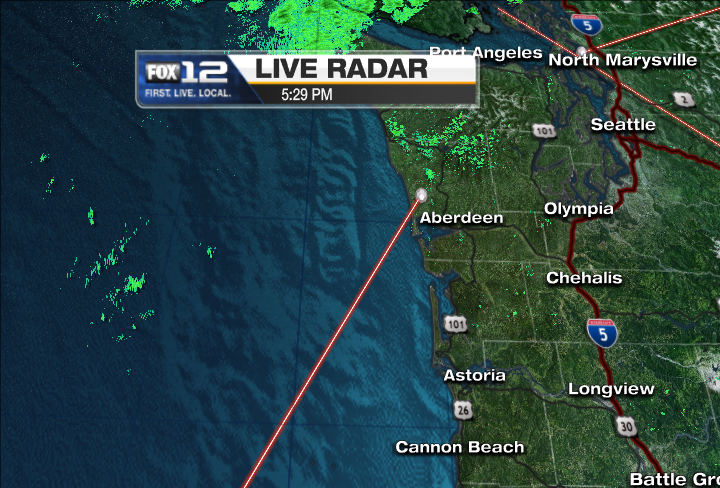 Vastly improved look at showers/rain on the North Oregon Coast and Long Beach (in our viewing area). The Portland radar has significant gaps at the lowest scan looking to the west and northwest. 4. Vastly improved look at showers coming across the Willapa Hills towards Longview; it drives me nuts when I see a wall of rain suddenly appear in a line from Longview to Olympia heading from west to east. 5. With the polarimetric scanning, we should know what the snow level is offshore (and onshore) as those cold showers and fronts come in from the northwest. Now we just need decent radar coverage over NOAA’s new home port down in Newport…there is no good low-level coverage from the Central Oregon Coast down to Brookings. But that seems extremely unlikely with our current economic climate of course. Enjoy the next two days (the last two) of summery weather. All models show a cold front coming in on Sunday. It may not be the beginning of an extended period of heavy rain, but we may not see 80+ again this season. It looks like we are all set for the east wind season down at Vista House. 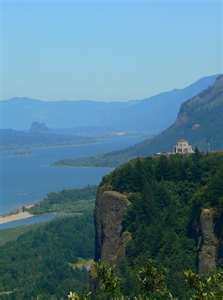 I would consider it the windiest spot you can drive to in the state of Oregon during the winter. Check out why on a previous blog post. If you recall last January I got together with Oregon State Parks folks and we put in a “temporary” sensor on a big block of concrete. They bought a new Vantage Vue sensor and even though it’s now still technically “temporary”, it’s attached to the solid steel rain gutter. A signal is sent down to the basement where a computer sends the data out to the world via CWOP. Up until two weeks ago the communication between the sensor and console under the building would intermittently go out. It’s tough for the signal to penetrate that thick concrete down into the basement. Moving it two weeks ago to the south side of the building really helped. There has been no loss of signal in 7 days. The direction was incorrect since we moved it (east was west and west was east…got it?). But today I went down there with the throngs of September tourists and calibrated it. By the way, I didn’t fit in well with the tourist crowd…most of them looked relaxed and didn’t wear a suit and tie. The one minor disadvantage of the south side of the building is that it gets REALLY hot on a calm sunny day, but who cares…it’s up there for the windspeed. I’m confident that on a 25 degree night with an east wind gusting to 80 mph that it’ll read the correct temperature. Just ignore it during the daytime when the wind isn’t blowing. You see, the National Weather Service radar is down for maybe 10 days (should be up within a couple of days) due to the big upgrade. It was done this time of year to avoid 10 days of no radar in winter…good choice of course. But the funny part is the one time the National Weather Service radar isn’t running is the same time KGW’s radar is down too. No one had radar imagery over us this past weekend. I had noticed the same thing last week on the afternoon we had showers move through. Ha! One would think that after spending, what, a million bucks? (well, that was maybe 13 years ago), but yearly/monthly maintenance costs, and the thing doesn’t work during the one time the NWS takes their radar down? I also think I remember an outage for many weeks or maybe a couple of months on that radar within the past two years. It’s just great irony. I’ve had bosses ask if it’s really worth it in our climate considering the tremendous outlay of money. The answer would be a resounding “No”. With our total lack of severe weather here, I doubt the average viewer would care and/or notice the difference between a station-owned radar and what the other 3 stations in town use. The delay between having your own radar and the live feed from any of 5 Nexrad sites is at maximum two minutes and as little as 10-20 seconds. If we were tracking supercell thunderstorms (or even plain thunderstorms) regularly it would be different; that’s why it’s common for stations east of the Rockies to own their own radars, even though they are weaker than the NWS 88Ds. But here in the maritime Pacific Northwest that time won’t matter while tracking little green and yellow blobs. And don’t get me wrong, if the boss walked up to me and said, “we’re buying you a new radar”, I’d jump up and down with excitement. More weather tools are always good. You are currently browsing the FOX 12 Weather Blog blog archives for September, 2011.